This post was made possible by Kit, who purchased me a copy of Death Parade from my Amazon wishlist to review. Thanks so much! 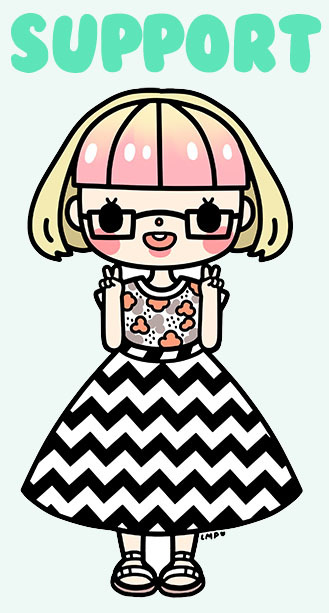 For more information on how to sponsor a Chic Pixel review, click here. I originally became aware of what would eventually become the Death Parade anime through “Death Billiards,” an animated short produced by Madhouse for the Young Animator Training Project’s 2013 Anime Mirai festival. The premise is that whenever someone dies, they are sent to a bar run by an arbiter who judges souls to decide whether someone will be sent to “heaven” or “hell.” While each bar is different, arbiter Decim’s bar is where two souls who passed away at the same time are sent. When they arrive, their bodies are in such shock that they often don’t remember everything about themselves, let alone the fact that they are dead. In order to best judge each person’s character, Decim pits his patrons against one another in various games, from billiards to darts and even fighting games. Though the original “Death Billiards” short only set up the general premise, the 12 episode Death Parade delves deep into questions related to how a person’s life and character can be judged, as well as who has the right to do the judging. Decim and the other arbiters are not human, but rather emotionless beings created for the sole purpose of judging the humans that walk through their doors. The intent, of course, is for arbiters to not be swayed by things like emotions when making their decisions, but as you can imagine, the morality of this is soon brought into question. The main source of this conflict arises from Decim’s unnamed female helper, who is assigned to his bar with no memories of who she is or what she is doing there. 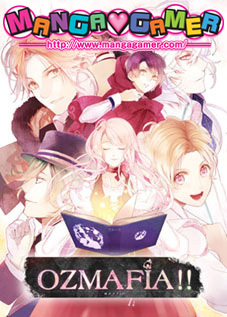 Each episode generally centers around the stories of two people who enter Decim’s bar and how he proceeds to judge them, but the black-haired woman quickly protests the gruesome manner with which Decim attempts to reveal their “true selves.” This comes to a head when it’s revealed that one of the new patrons is a murderer, and the circumstances of the murder are not as clear-cut as you might initially assume. Of course, it’s easy to quickly decide that someone who has killed another person can’t have a “good” soul, but when you stop to think about the many complicated reasons and events that might have lead someone to take another’s life, judging them is not as easy as it seems. 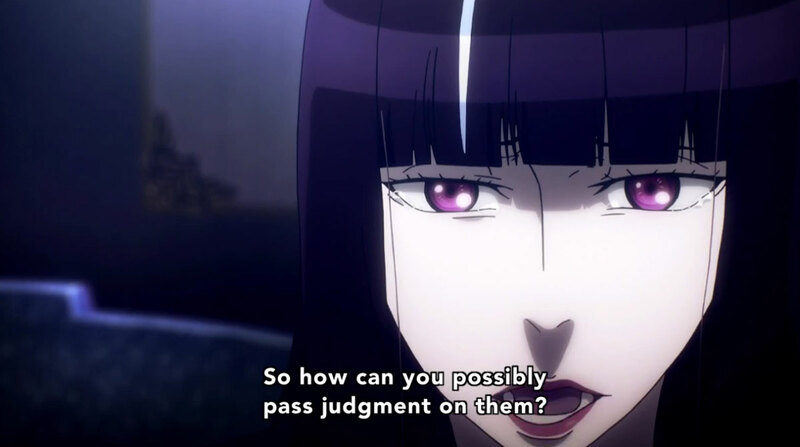 If I had to describe Death Parade in one word, it would be “intense.” Not only is the theme of death and judging who should go to “heaven” or “hell” inherently heavy, but the content can get rather gory, as well. I found that I could only watch one episode per day and then would need to stop to digest what I’d seen. Usually I’d have to follow it up with something lighter, like Legend of Zelda: Breath of the Wild or Osomatsu-san, so I wouldn’t go to bed in a somber mood! That’s not a knock against the series – in fact, it’s a testament to the weight of each episode, and the consideration that went into making sure that each character, relationship, and backstory. I did feel that some of the individual patrons were a little cliché, but even then their stories were usually told in a way that still made them impactful. There is a relatively wide cast of characters for such a focused 12 episode series, ranging from a higher being that takes the form of an old man named Oculus to Ginti, another bartender who uses a distinctly different method of judgement than Decim. By far the highlight of all the characters for me was Decim, who slowly shifts from cold and calculative to having an almost childlike sense of wonder over the course of the series (for reasons I won’t spoil here). His relationship with the black-haired woman and how it develops as they both attempt to understand each other is also very moving. But though she doesn’t get a lot of screen time, I also have to mention Mayu, a deceased high school girl who is sent to Ginti with her idol heartthrob. Their episode is my favorite in the series, as it combines humor with the show’s distinctly morbid themes. I would be remiss not to mention the numerous Buddhist references throughout the series, though I am by no means an expert on the subject. 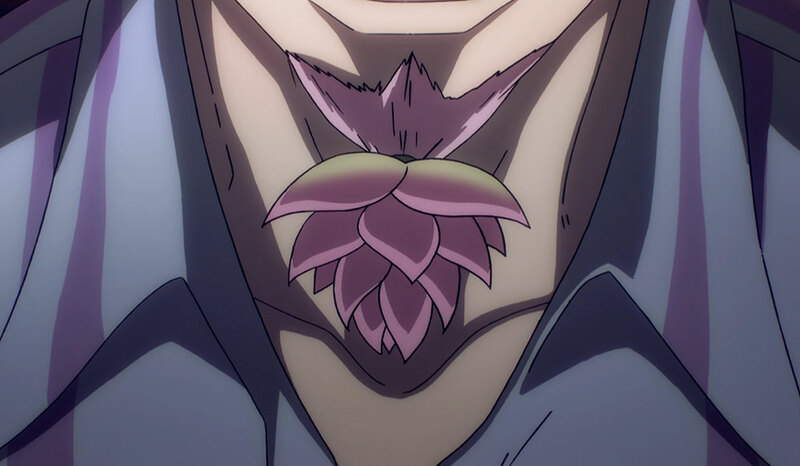 The lotus is a recurring motif, and even shows up in the form of Oculus’ hair and beard. Buddhist sculptures are depicted in the catacombs between the bars of the strange “in-between” space the arbiters and their overseers inhabit. Then, there is the series’ idea of “heaven” and “hell,” which is frequently reiterated to simply be easy shorthand for either being reborn in another life or being sent to an endless black void. I found it fascinating that these Buddhist motifs were interspersed with advanced technology that a department called the information bureau uses to monitor humans and obtain memories to send to the arbiters for the judgement process. 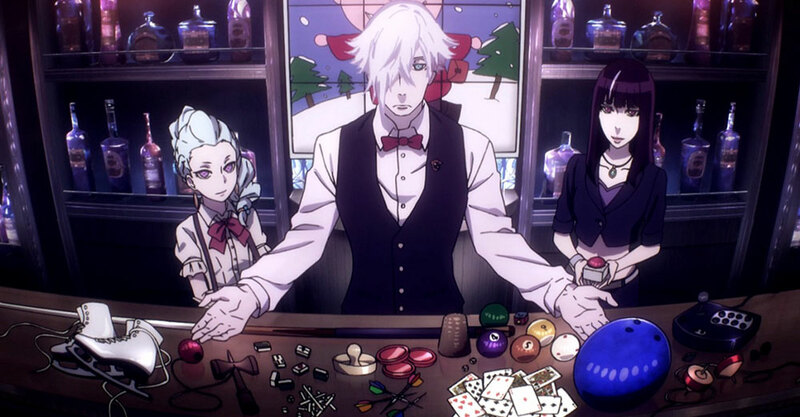 Death Parade is the kind of series I’ll be thinking about for a long time to come. It’s also the type of show that I would be confident to recommend to someone who isn’t necessarily a fan of anime, but is interested in aspects of Japanese culture and narratives that tackle difficult themes such as death. 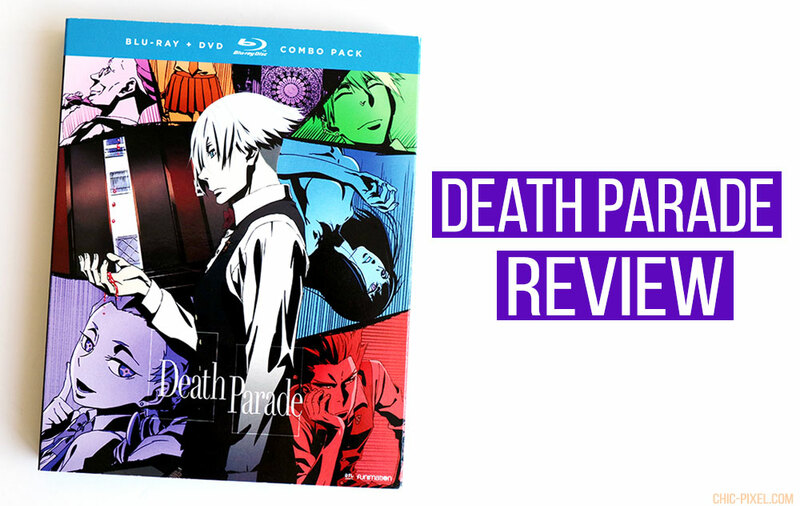 It may not be something you’ll want to start just any rainy afternoon, but if you’re prepared for a heavy, thought-provoking experience with a bittersweet ending, Death Parade comes with my highest recommendation. Death Parade is available to stream for free on Crunchyroll and Funimation in North America, and AnimeLab in Australia. You can also purchase the Blu-ray/DVD combo pack on Amazon. Animal Crossing: Pocket Camp is Out Now in Australia!